By Bill Hudson, April 1 in General & Misc. I am venturing on a new project. 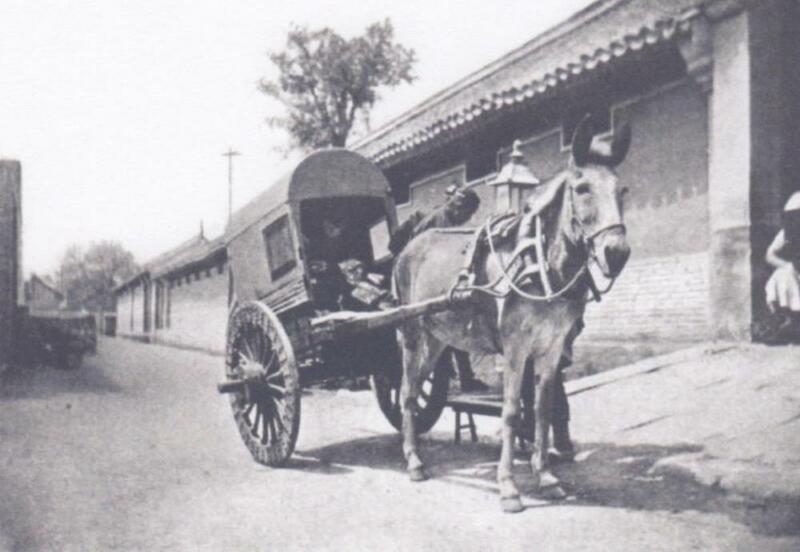 Simmy from UK, former member of the late Scale Model Horse Drawn Vehicles forum, sent me a CD with tuns of photos of two different Chinese carts. He built one in 1/8th scale. I found them intriguing and decided to see if I can build one. I will be building in 1/12th. 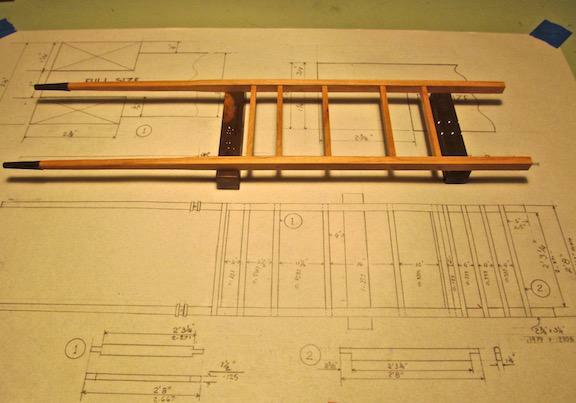 I thought that this would be an easy project, now I could build with my trembling hands. While I now have my doubts I am continuing on. I will post the build as I go. 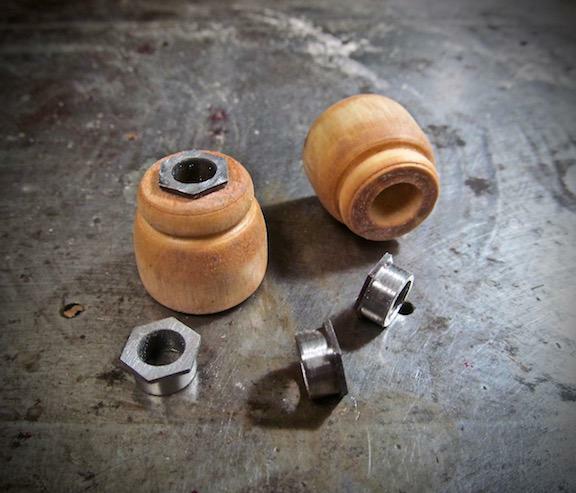 Start on building the wheels. 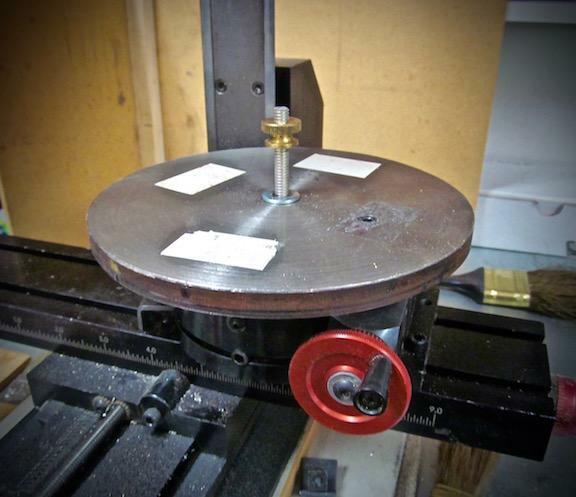 I no longer have a large enough lathe to turn the wheels so I had an adaptor plate made to mount on my rotary table of my Sherline mill. The wheels are made up of 9 segments. That = 40º triangles glued together . 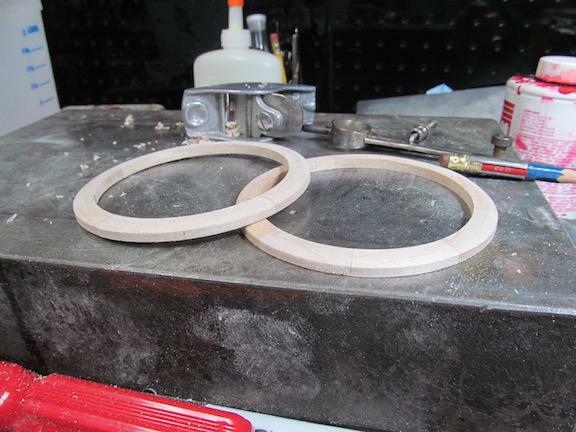 These were both mounted on the plate with double stick tape and cut to outside and inside diameters with a mill cutter. Next came turning the hubs. I used An old Magnolia limb I had laying around under my work bench in the garage, for years. 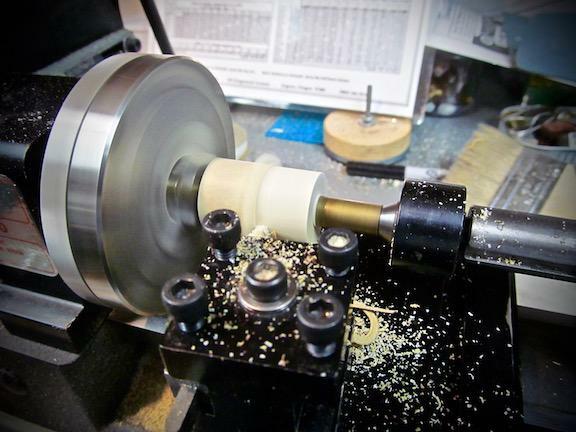 I drilled a couple sections and pressed in a long piece of brass tube to mount it in the lathe. I later turned the metal boxes from hex stock steel for the front of the hub (AKA nave in Europe). 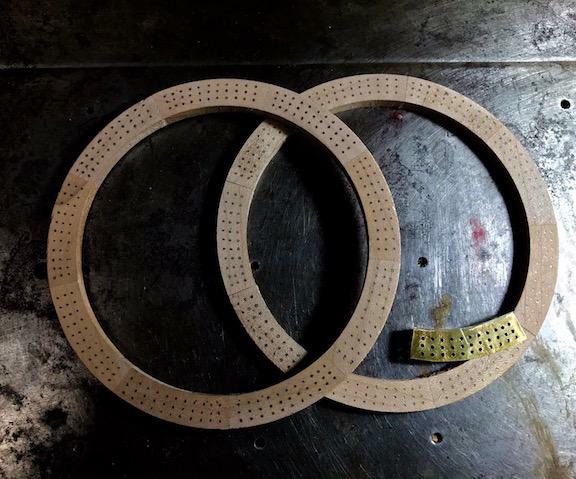 These will be drilled of the spokes later. 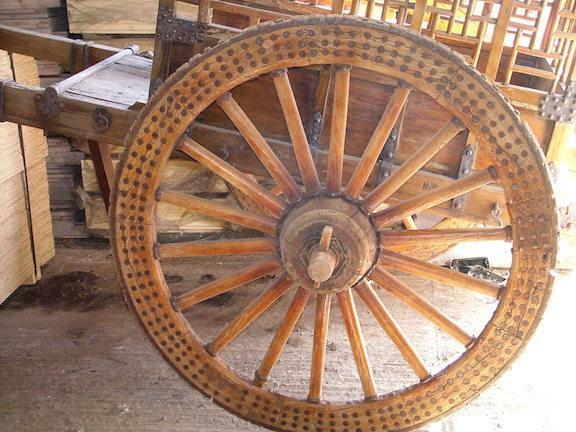 The original wheels had nails driven through the sides and riveted on back side. The guess is that the carts ran on rough, rock roads. the nail helped prevent damage. A template was made to mark the hole locations on each segment. 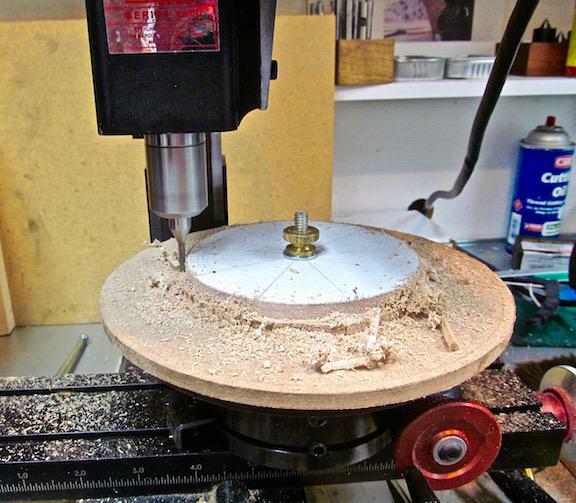 A fixture had to be designed to drill the holes accurately. 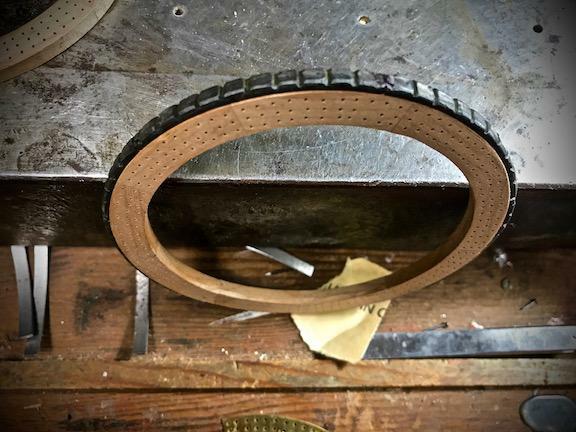 There are 33 holes per segment making a total 297 holes in each wheel. 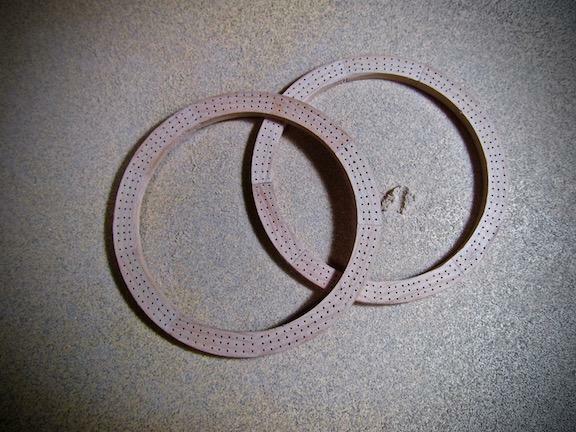 There is a difference in hole spacing between segments so each segment needed to be marked separately but all holes in each line had had to been the same circumference. Developing the tires. On the original the tire is made up of six individual sections and nailed on to the wheel. 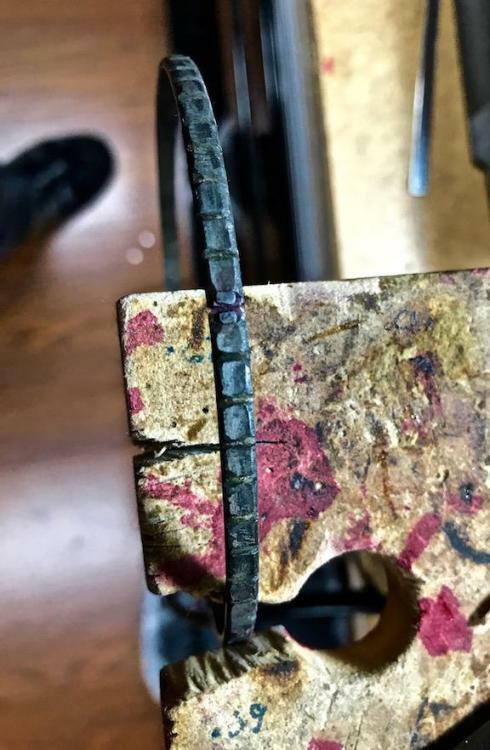 to make it simpler for me I rolled and silver soldered the joint of a main tire. 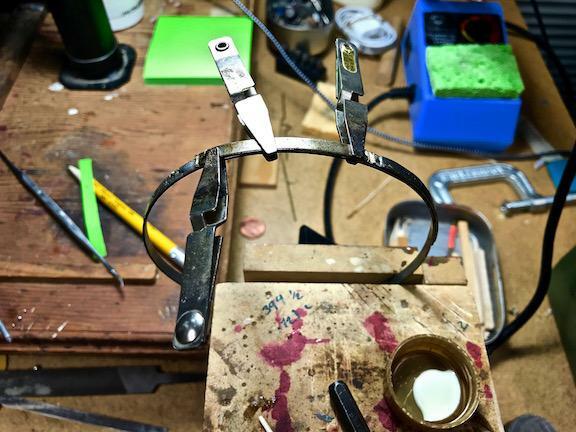 I then made each individual section which I some soldered and riveted in place. Each of the cleats were filled out to look rough. This is the point I am on th is project. Great work! Can’t wait to see more. 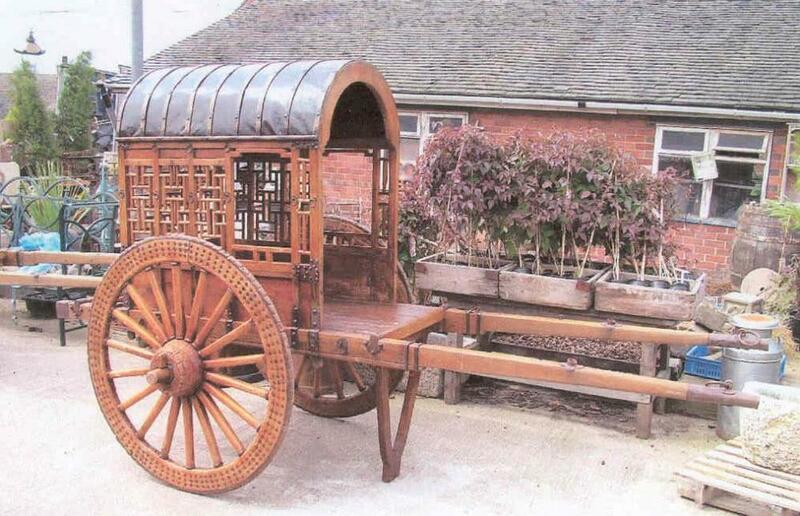 This is a beautiful chinese cart. How large are the wheels? I really appreciate seeing the setup and jigs you create. The actual wheels are four feet in diameter. They have nine segments, total eighteen spokes per wheel. I had problems locating nails that would work for the wheel sides. 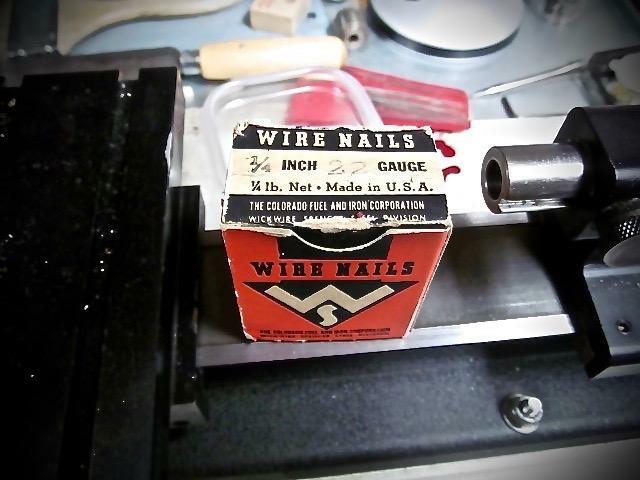 I had this antique 1/4 # box wire nails and decided to use them. 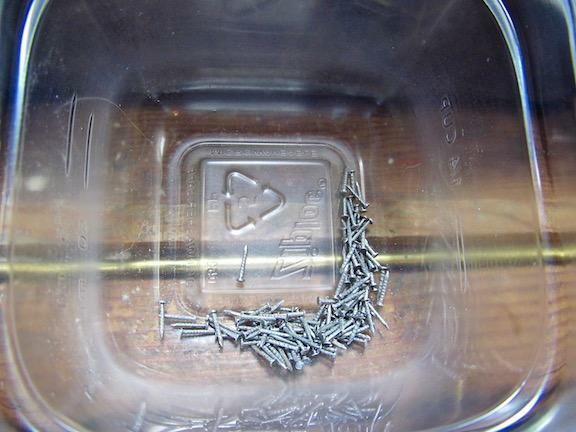 I have to turn the diameter of the nails down and true them up; all 594 + of them. 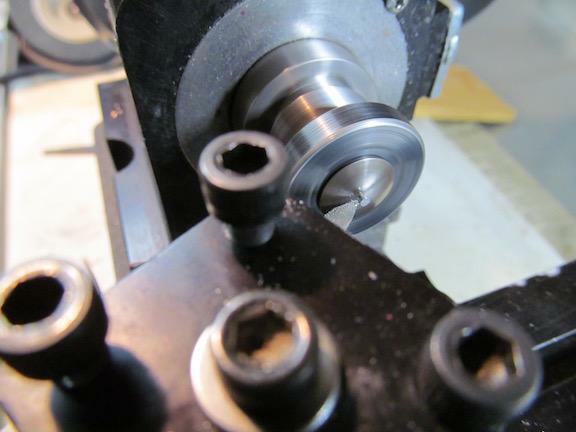 I set up a collet in my lathe and turned them. Amazing and wonderfully fun. I bet you are having a blast. So what is more fun for you, figuring out how to set it up and do it or actually doing it? Meaning drilling all those holes, turning all those nails? Great to see the excitement of a new project. Thanks for the compliments Bill, I think trying to figure out how to do it is more fun than actually doing it much of the time. It took me several attempts just to figure pout the template for drill int the segment holes. 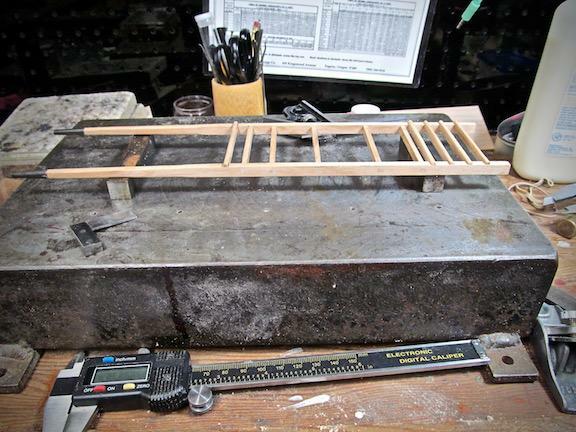 Once I got the fixture set up drilling the holes was just taking the time to drill all 500 + holes. 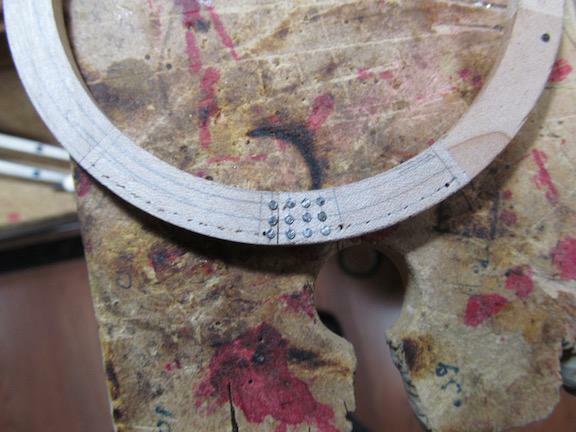 The biggest problem was keeping the holes aligned as the tiny drill wanted to wander when it hit hard grain. 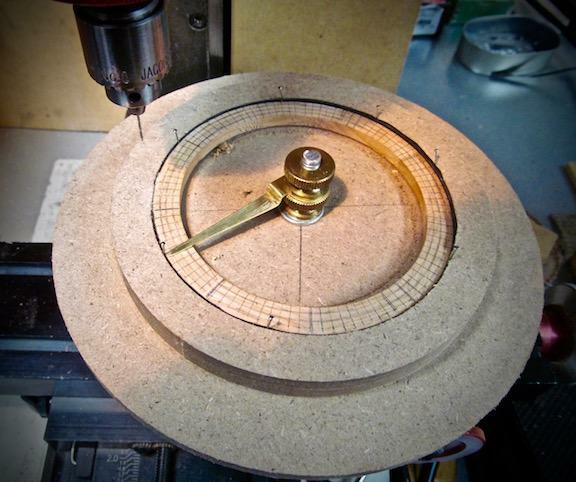 I solved much of this by starting the hole with a center drill first. I can only work about an hour or so each day so it took me much of a week to drill all the holes. Same to for turning own the nail heads. My lathe is set up for that and locked in position. 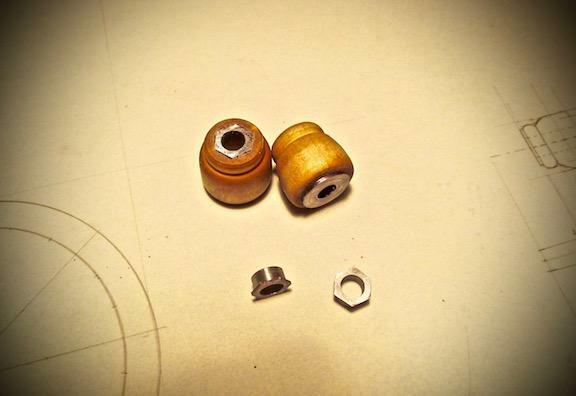 so ever once in a while when I need something to do I set down at the lathe and turn nails. I'm about 1/3 of the way in finishing the nails. 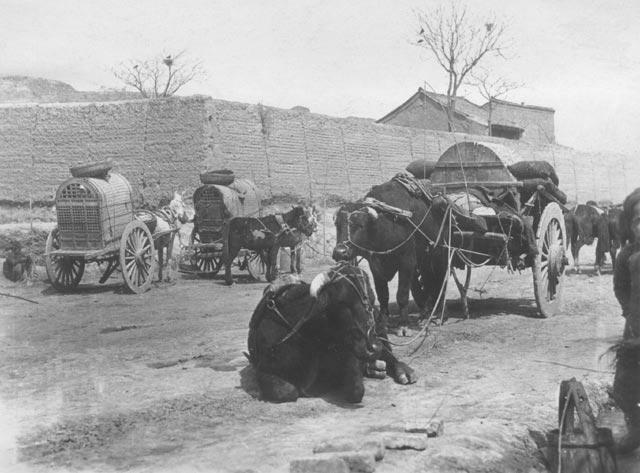 Some photos from the past of Chinese and Mongolian carts in use. Note they were pulled by a variety of animals. Note also sometimes the cab was covered with a fabric to break the cold. I have decided I like oxen for the cart. 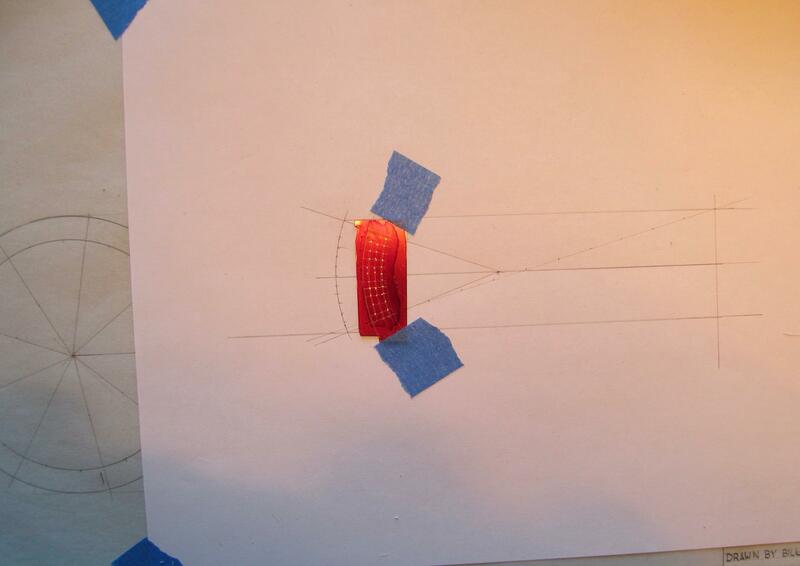 I have done some research and made preliminary pattern drawings. As I go along I plan on adjusting the pose some. 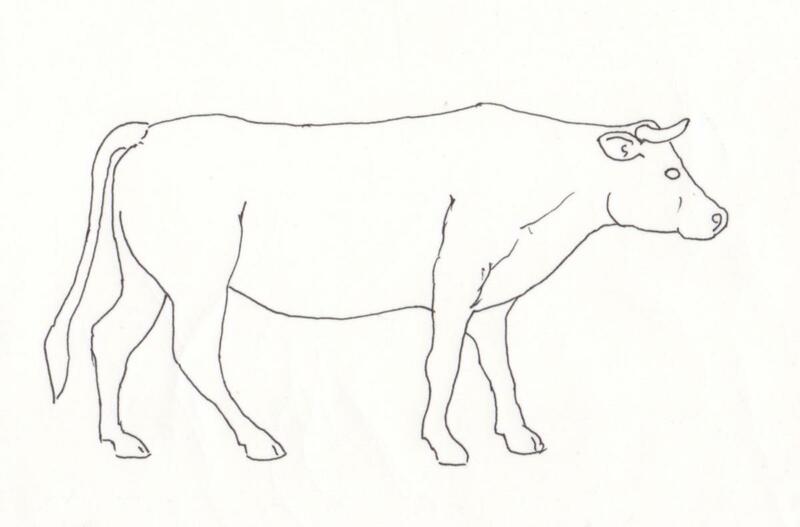 Wow, you can draw oxen too?!! I'm most impressed! Will you carve them from wood? Yes it will be carved from wood. I my use some Plasticine clay to work out some of the details first before carving the wood. Since that method is a new to me I'm not sure of the results. I have been following a couple of Japanese Buddha statue carvers and they model in clay first and then transfer the measurements to the wood using a graph method. They work in much larger carvings. I have carved horses and oxen in 1/4th scale and ponies in 1/24th. (I'm a city girl that had cousins with horses to ride when I was a child; I had all the fun without the chores.) 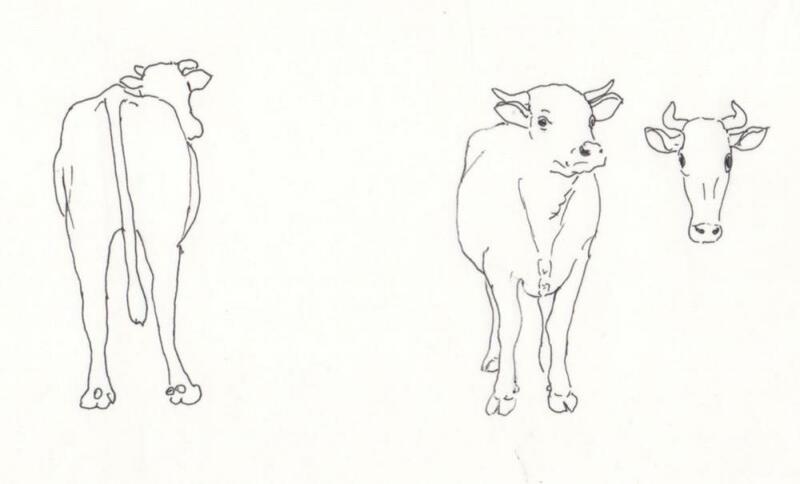 I had to look up the difference between Cow and Ox. The animals that I have purchased, I think from a German producer Schleich are very realistic - but I think the puppies are too big, but nice examples. I am sure that you will carve the most incredible ox. It is fascinating concept of transferring the measurements of scale model via graph method in 3d. I understood drawing in 2d with a graph as a child, and it was much easier for me to reproduce a drawing (at approx age 11- 12) by using a graph to enlarge and redraw; I never entered any of those contests as a child, but I do remember spending a couple of summers drawing. Looking back, even as a child I found the application of math and scale easier then locating my natural talent to draw. Self dx, time to re-read the book, Art & Fear. So many people carve waterfowl with a dremel for foredom with a flex shaft attachment, so I'm looking forward to observe and learn! An ox is just a bovine (domestic cow or bull) trained to do heavy work. Possibly the closest to a true ox would be a Musk-Ox. Usually steers were used as oxen but cows too. 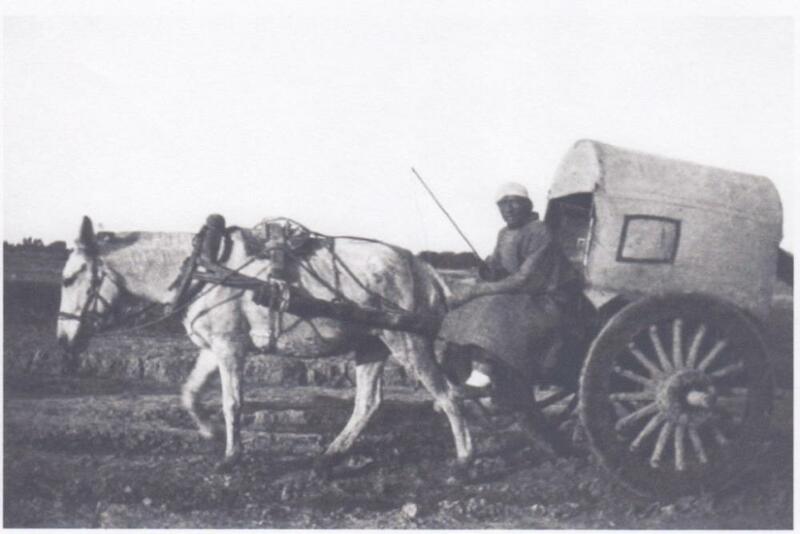 The pioneers traveling west often used their cows and bulls to pull the covered wagons. In early logging days in Oregon, large teams of domesticated bovines were trained to haul out the logs from the woods. Water buffalo are sometimes confused with oxen and were also used as draft animals and would be acceptable as an animal for pulling the cart. Great project Bill, thank you for sharing all the photos. I especially like the steel tire, it looks so realistic. Bill, I am curious, the source of center drill bit you are using for the wheels, as I have also experienced the wandering drill bit for many wood projects. 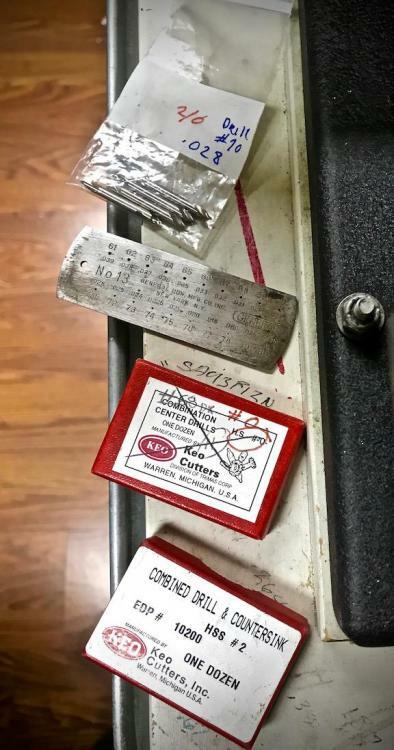 The center drill bit is common, but one that works in miniatures the size of a brass nail, that is generally used here in the US for connecting electrical tape runs for miniatures, is one really small piece of brass. Each time I go to a miniature store I buy there brass nail inventory for projects like this and for using them as nail head trim for leather, and of course the normal use for electricity or to nail hardware to a piece of furniture. 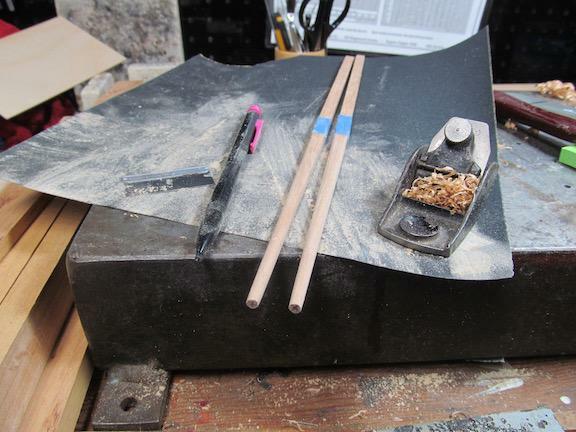 I realize you are turning your nails down on your lathe! This task of turning nails down to the correct sizer further illustrates and reinforces the concept that not finding the right hardware off the shelf, gives me the incentive to learn to make it myself. The smallest combination center drills I have are size 2/0, .028 drill tip = #70 drill. There may be smaller sizes but I have not needed or round them. The tips the 2/0 is very delicate so ease is needed to start drilling. 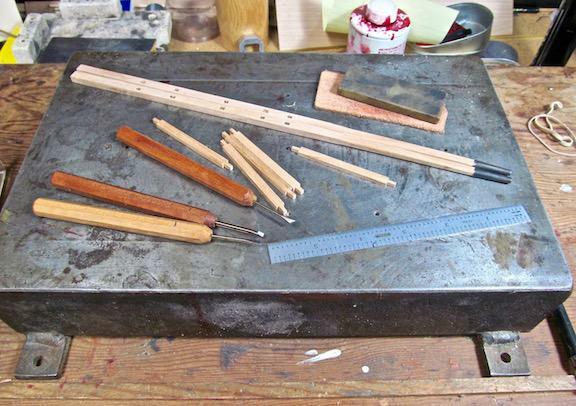 Sometimes I just use them in a pin vise. I buy mine, by the dozen, at a local machine tool company. I have a local distributor for this mfg, too! Thank you for the assistance in sourcing the center drills, it is very helpful.